U-Bolt Specifications and Information at Dsuban Spring Service and Dsuban.com. U-bolts we make are custom per your order and are not returnable. These u-bolts are for suspension, leaf spring and body mounting primarily, but have hundreds of other uses. We bend our own U-bolts on a hydraulic bender cold so the grain of the metal stays oriented in the right direction for maximum strength. 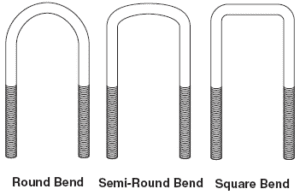 The stock rod may be bent in many shapes but the most common shapes are SQUARE TOP, SEMI-ROUND TOP and ROUND TOP. The only thread pitch we use are SAE (fine) and are manufactured by rolling a rod between dies creating threads for maximum strength. 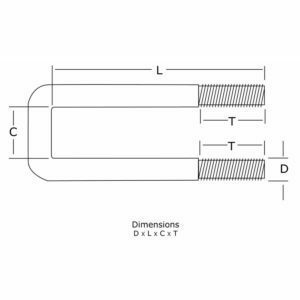 This makes the non-threaded part of the stock slightly smaller in diameter than the diameter of the threads and are not thread-able beyond the way they are. Small diameter U-bolts, especially round bend (1/2 dia and smaller) are more susceptible to measuring slightly wider due to the spring-like nature of the steel, but U-bolts, when properly torqued will conform to the shape of the item it is fitting over. If the item the U-bolt is fitting over is 3 inches wide, then the proper width U-bolt would be 3 inches wide. This product is not for ornamental use and is designed to be torqued. Please call with questions or concerns. Video of how a U-Bolt is made. We do not stock any form of stainless steel material and do not offer any type of plating or galvanizing. All U-bolts are oil finish steel with SAE threads only. Note that the “L” measurement (length) is not exact depending on total rod length, consequently the “L” measurement may be slightly shorter or longer. 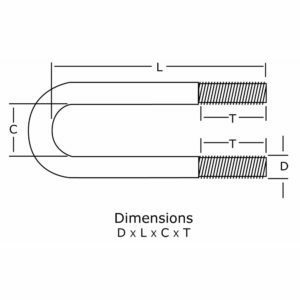 We add “C” and “L x 2” measurements to get the total material length which is made in even lengths, 22, 28, 38 etc. 150,000 PSI Minimum Tensile Strength; 130,000 PSI Minimum Yield Strength; 120,000 PSI Proof Load; 35% Reduction of Area; 10% Elongation. U-Bolts produced to SAE-J429 specification. This material is a cold drawn, stress relieved, micro-alloyed, 1541 modified steel. This steel cannot be welded on due to the orientation of the grain of the steel. U-bolts from 3/8 to 9/16 diameter are Grade 5, while 5/8 to 1 1/4 diameter are Grade 8. This picture is typical of our bend types. Occasionally we do not stock some extreme lengths (short/long) in your needed configuration and not all bending widths can be ordered on our web site. *If the size or bend style you need is not listed here or on the detail pages, or you need help, please call us at 513-860-1200 (toll free number 877-537-8226). Click Here for a u-bolt request for quote (RFQ) form.